These pages focus on Geraldton & the Midwest in Western Australia and the rail scene in this area. Rail operations centre on the Aurizon's operations at its two depots Narngulu and Narngulu East both of which are situated on the outskirts of the Port City of Greater Geraldton. Watco Australia also have operations in the area and run trains on behalf of CBH & ARC Infrastructure. Grain from two lines, the former Midland Railway and the South Line (the former Northam to Mullewa Railway) now open as far south as Perenjori via Mullewa, Morawa & Perenjori. Mineral Sands trains from the Eneabba branch via Dongara to Narngulu used to run as did a coal train from Collie in the South West to Narngulu but this ceased in 2010. 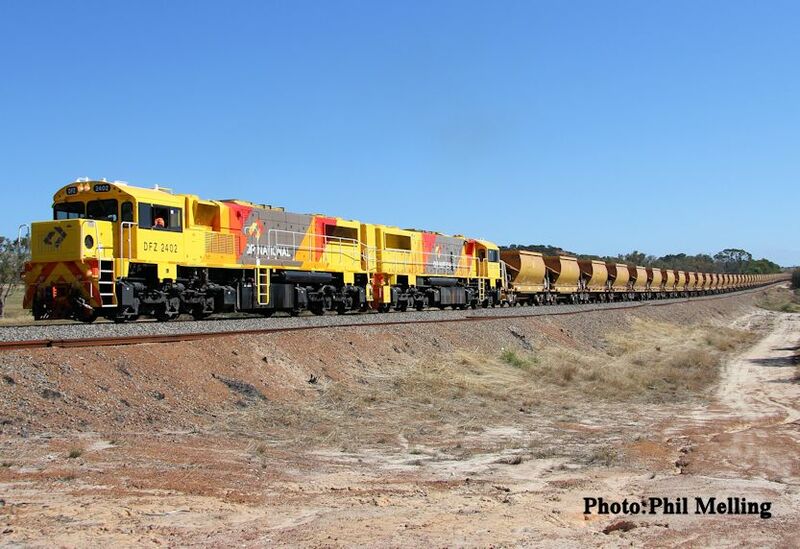 Iron ore trains operated from Ruvidini (Mullewa), Tilley (Morawa), Perenjori (both have now ceased) and in 2012 Karara. In 2005 there was a new railway constructed between Narngulu and the Port of Geraldton. The new line opened in September of that year and the old foreshore railway was decommissioned and removed, all photos showing trains on the old line in our earlier galleries are now part of history. A big thanks to all who work in the rail industry for allowing us to photograph our favourite subject trains. We hope you enjoy our pages and remember safety first when near rail lines. These pages feature the photos of the Melling boys and their Dad Phil Melling. You may note some differencies with numbering/ classification on locomotives this is due to a renumbering scheme and further modifications to existing locos eg. DA 1571 became DAZ 1901, P2001 became P2501. 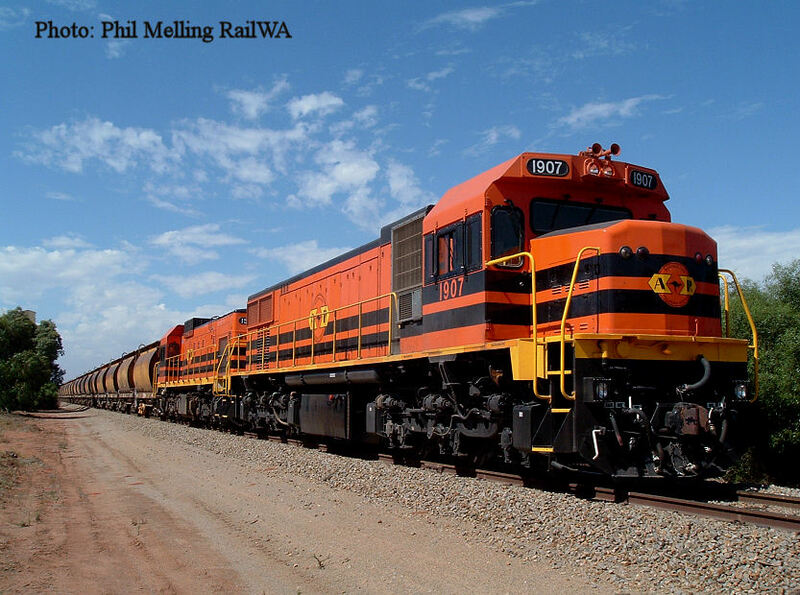 Two of the DFZ class are painted in QR National colours, here we see both of them DFZ2402/ DFZ2403 on an empty iron ore train heading to Ruvidini (Mullewa) on 13 November 2011. Rio Tinto's 9401 is seen on a low loader just north of Geraldton heading to the Pilbara on 13 May 2007. 9401 had been repaired in Perth after a derailment. 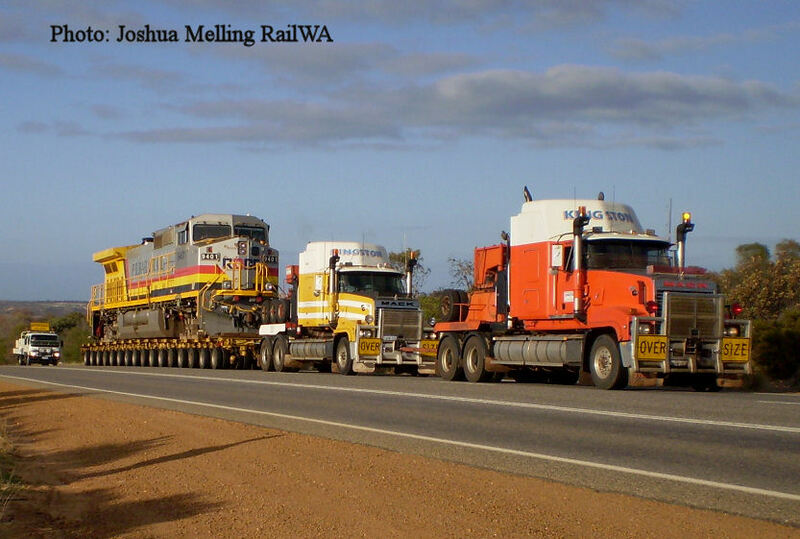 ARG liveried 1907 & AWR liveried A1514 combine to haul a loaded mineral sands near Narngulu on 20 March 2004. 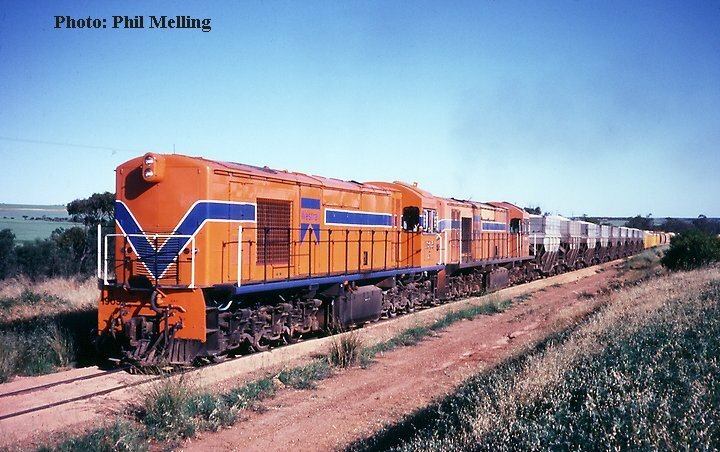 Showing how the railscene continues to change, since this photo was taken A1514 was renumbered to 1204 and transferred to Port Lincoln and 1907 also relocated to Whyalla so both are now in South Australia, ownership of the locos has also been transferred. The then English Electric Company Australian manufacturing plant produced these two locomotives for the former Western Australian Government Railways Commision. R1905/RA1909 haul a talc/grain train near Arrino heading for Geraldton on 7 October 1983. Both locos have been scapped and talc is no longer hauled by rail.